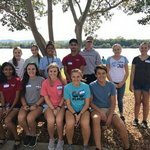 The mission of HOSA-Future Health Professionals is to enhance the delivery of compassionate, quality health care by providing opportunities for knowledge, skill and leadership development of all health science education students, therefore, helping the student meet the needs of the health care community. HOSA provides a unique program of leadership development, motivation and recognition for secondary, postsecondary, adult and collegiate students enrolled in Health Science Education programs and/or interested in pursing careers in health care. HOSA is 100% health care! HOSA is not a club to which a few students in school belong. HOSA is a professional student organization and a powerful instructional tool that can be integrated into the health sciences curriculum and classroom. In addition, participation in HOSA provides students with a pathway to achieving diploma requirements. Students participate in a variety of classroom activities, job shadow opportunities, internships and field-based investigations. Through these activities, students gain skills in personal management, problem solving, communication, teamwork, employment foundations and career development. HOSA is 100% healthcare and concentrates every aspect of its mission and resources on this employment sector. Alabama HOSA offers 40 healthcare industry endorsed competitive events; they are utilized throughout the academic year as instructional resources. HOSA’s Competitive Events Program includes four events specifically designed for students with disabilities. Chapters are modeled like small learning communities where students hold meetings and work as a team to develop a business plan of action that includes career exploration and development, community service, and activities that promote effective leadership. The National Healthcare Foundation Standards are used to establish rubrics to evaluate student performance in the competitive events program. HOSA uses awards and recognition in the same manner that the healthcare industry identifies “outstanding employees” as models. HOSA is endorsed by the Health Science Education division of ACTE and the US Department of Education. HOSA’s program incorporates continued health science education and development from the middle level to the secondary level to the post-secondary level to alumni. HOSA’s chapter model also allows for industry-based chapters to allow for the HOSA experience to happen simultaneously at the secondary/post-secondary institution and then to resume at industry-based HOSA programs where students serve as interns and/or entry-level medical jobs.